Cream together margarine with sugars until light and creamy. Add egg and extracts and blend in. In separate bowl mix flour, salt and baking soda. Add to sugar mixture. Stir in water as needed until batter is smooth. Drop spoonfuls of batter on cookie sheet. 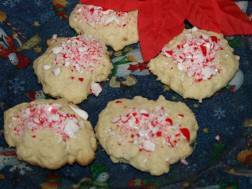 Remove cookie sheet and sprinkle with crushed peppermint candy. Return to oven for 1 minute or until candy begins to melt. Remove and cool on wire rack for twenty minutes. This is the first year that my daughter and I have made these cookies so were hoping they turn out good, and people eat them! I have made these every year !! So yummy, I have a hard time not eating them ALL myself !! !